Hip hop culture, fan engagement, startup culture and the use of mobile technology has been changed, all by a Carolina artist named J. Cole. June 5, 2013 was a regular evening at home. I was winding down and strolling my Twitter timeline for the daily news when the above Tweet from Hollywood Cole showed up. 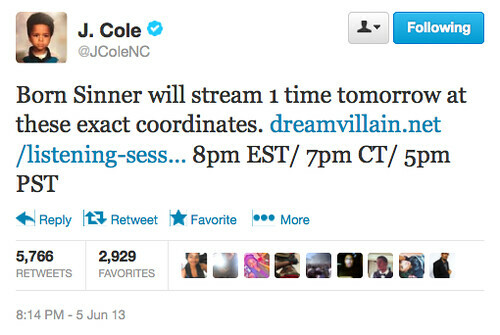 Immediately I went to Dreamvillain to confirm the details: On Wednesday June 6, 2013 at 8PM Born Sinner, Cole’s yet to be released (or leaked) new album, would stream simultaneously at eight locations in the United States. Hollywood Cole’s tweet was exciting for several reasons. 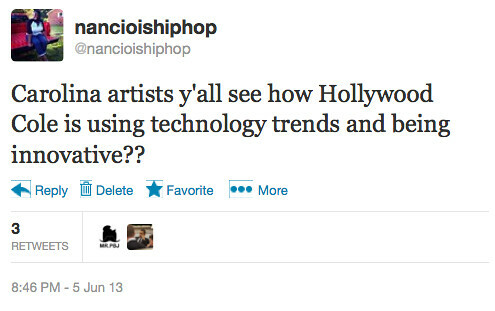 Less 30 minutes prior, I’d read and tweeted an article on The 9 Most Influential Hip Hop Artists In Tech. 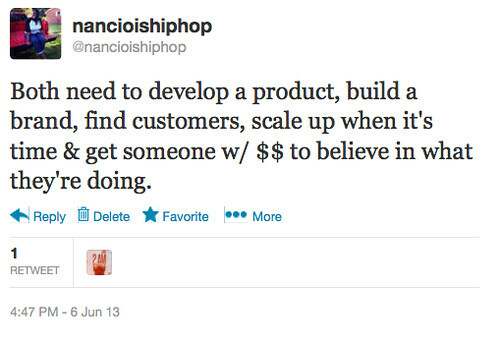 After the announcement, I began thinking about how J. Cole was not only influential, but also using both mobile technology startup culture to enhance how artists market, promote and engage fans before new product is available via retail. 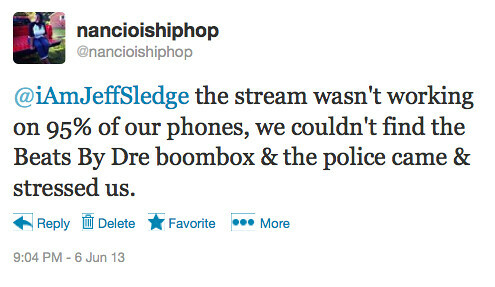 The use of mobile technology in hip hop music for fan engagement is not new. In previous episodes of Hip Hop Bytes, my blog’s audio time capsule that discussed technology and it’s impact on hip hop culture, host Mr. Shadeed talked about the importance of engagement and mobile computing on several occasions. In Hip Hop Bytes episode 4 from February 2010, he explained how hip hop/rock band Shinobi Ninja were using the technology with success. Shinobi Ninja’s mobile app was used during their concerts. In September 2011, Live Nation’s president Russell Wallach talked about social media and mobile technology in the live music industry. His predictions centered around the fan’s ticket buying and concert exerience. 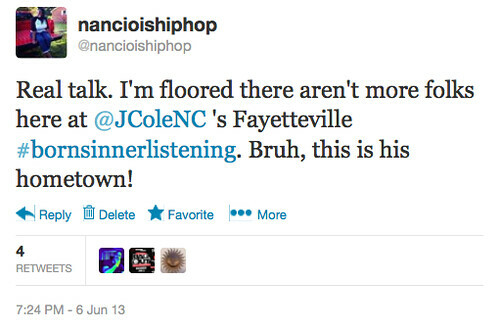 J. Cole is also not the first Carolina hip hop artist to use mobile technology for fan engagement. Raleigh, NC’s Inflowential released an iPhone app in February 2011 that kept their fans informed with the group’s upcoming shows and offered exclusive content. Then in May 2011, 9th Wonder released an iPhone app with basically the same functionality as Inflow’s, except the Grammy-award winning producer’s version also included videos and interviews. Since the above, not much has changed. In 2013 many artists have apps available with all of the above functionality. However, there have been no hip hop artists to use mobile technology along with startup culture to change how fans experience a new album weeks ahead of its retail release. Startup culture in North Carolina is very hot right now, particularly RDU (Raleigh-Durham-Chapel Hill), which is where I’m based. 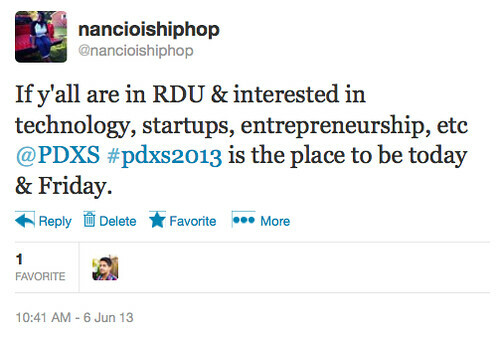 There are several technology and startup incubators throughout the state. Without going into too much detail (because that’s a whole nother blog post), there has been talk that between the music and technology scenes, North Carolina could become (is) the “next” Austin, Texas/Silicon Valley mashup. 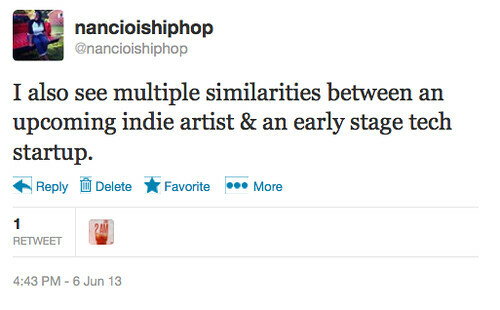 So if you take the previous points into consideration — “there have been no hip hop artist to use mobile technology along with startup culture and change how fans experience a new album weeks ahead of its retail release” — combined with the fact that it was a Carolina artist who did it first, maybe now y’all can see the reason why what J.Cole did with #BornSinnerListening is so groundbreaking . J. Cole’s #BornSinnerListening experience was made possible with the Lisnr app. Lisnr is a startup that was created by Rodney Williams. The app uses ultrasonic frequencies (ultrasound) to unlock Lisnr exclusive content. 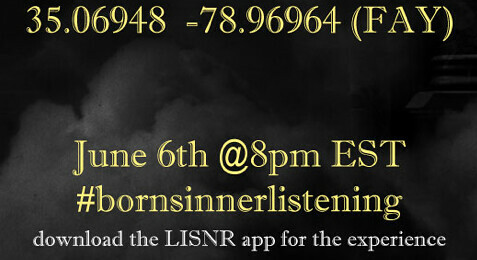 I’d never heard of Lisnr before yesterday and was very excited to see how the #BornSinnerListening experience was going to turn out. Since Durham is only a 1.5 hour drive away from Fayetteville, I was determined not to miss this event. First I had to figure out the coordinates of the FAY #BornSinnerListening. Before downloading the app, I googled the Fayetteville, NC coordinates. It returned Ruth Davis’s Bridals & Formals store. First I was like, hold up. Hollywood Cole is doing a listening session in a wedding dress shop? Nah, B. Figured that wasn’t right so I tried again, this time adding “map coordinates” to the search. It returned a city in the Middle East. Third time I decided to just open the app and go from there. The location ended up being 1916 Skibo Road at the Market Fair Mall. The event was scheduled to being at 8 pm “sharp”. So I hit the road around 5 pm. Between rush hour traffic and Tropical Storm Andrea, the ride took almost three hours. I arrived right at 7:57 pm. It was all good though, I was too excited about the event to be upset over traffic. Lisnr works by having the app open and then content being “unlocked” for access. For the #BornSinnerListening, that was supposed to happen at 8pm. 8 pm came, and there was no unlock on my phone, or anyone else’s phone. Several of us there checked the Twitter hashtag feed and saw that the event was starting late. I counted 30 folks in attendance. Needless to say, I was pretty surprised at the turnout. There were a few other hiccups. Nothing I’d consider extreme, because I expect with technology, no product is usually 100% problem free. There were several aspects I loved about the #BornSinnerListening. Since the stream started late and the number in attendance in Fayetteville was small, I had a chance to meet and talk with a lot of the folks there. Many of them were college students and some had just gotten off work. One dude brought his son. Another lady had her dog, who was running around sniffing people’s feet. Since FAY is a military town, there were a couple soldiers and they were talking about a recent deployment. While we waited, folks talked excitedly about the upcoming album, what we were most looking forward to and what we liked (and disliked) about the #BornSinnerListening’s setup. Since we were outside in the parking lot of the mall, there was a lot of room to move around and get fresh air. It was really cool to be able to enjoy a nice Carolina evening with great weather and good, new music. It was like being at a cookout without the food. The stream wasn’t working on most everyone’s phones. The one of two phones it did happen to work on was a guy named Zack Cole, who said he was J.Cole’s brother. Zack used an AUX cable to connect the phone to his car speakers. Then everyone gathered around his car to listen to the album. The opportunity to connect with people on this level would never have happened at a traditional listening session. So how’s Born Sinner? Well since the Lisnr content never unlocked on my phone, I didn’t really get to “listen” to it like I usually would a new album. What I did hear though, I enjoyed. I do remember the production well, since in an open area it’s easier to hear beats then it is to analyze lyrics (at least for me it is). What do I think of the Lisnr app? Since the unlock technology didn’t work on my phone, I’m disappointed I didn’t get a chance to experience the album like I expected too (with headphones). I love the gooey (appearance/layout) of the app, which makes it very easy to learn. It probably took about two minutes to figure out how to use it. Yesterday many hours before the event, the “LISNR” turned on automatically, even though I had the notifications and ‘pause on background’ settings turned off. I had to reboot my phone to turn the LISNR off. There were visuals to go along with each track on Born Sinner. A bit bummed out that I didn’t get to see that full functionality. In the app’s news page, Stalley and Nas has new content coming that will be unlocked soon. I look forward to finding out if we’ll have access to that content at home or will have to go to a special location to unlock it. My biggest takeaways? Hip hop culture, fan engagement, and the use of mobile technology has been changed, not just for me, but hip hop fans everywhere. It’s important to point out that regular people had the opportunity to attend the #bornsinnerlistening. Listening sessions are usually reserved for industry people. Folks also had a chance to attend a listening session of a major rapper without having to sneak in a cell phone and worry about getting caught then kicked out. Hip hop artists should really consider tapping into the startup market and look to partner with a company to create something fresh. There is always the potential to build on an existing idea and make it even better. That’s exactly what J. Cole did. Thanks to him, I will never look at a listening session in the same light. This entry was posted in Business, Commentary, Events, Technology and tagged #BornSinnerListening, J. Cole, Mobile, Mr. Shadeed, Roc Nation, Startup, Technology. Bookmark the permalink.